While Google’s driverless car technology works on GPS, folks at Lovely Professional University have come up with a driverless car that operates on mobile device. Just for the record, it still needs someone to operate the vehicle. 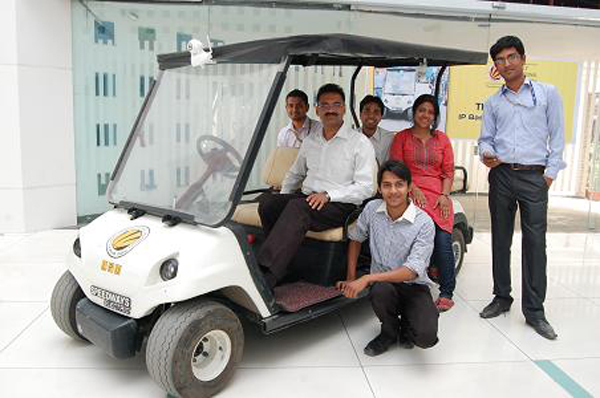 Four students of Electronics & communication and Mechanical Engineering of LPU, Punjab have effectively tested and developed a car that can be operated via cell phone from anywhere around the globe. The car runs on both, auto and manual modes and the team at LPU has successfully tested it for over 1000 kms. It should not be deemed as an amateur prototype, as it features some clever safety provisions like child-lock and night vision. Bikas (MTech ECE), Lokesh Ramina (BTech ECE), Rahul Jain (mech engg) and Suvendu (mech engg) contributed to the radical design of the car. Speaking on their success, they said, “We are very happy on the success of our future cars. We collaboratively devised the car utilising the internet , mobile phone, laptop, C+ programming language, microcontroller board with ATMEGA 128 IC under the electrical control circuit. Many a time, we got help and moral boost from our mentors when we faced hurdles in the project.” The prototype is an all-electric car, which can be further developed for different power sources. Next time you lose your cell phone, don’t forget to call the car insurance guy.